I can't actually believe it has been a year and a half since this pattern was originally published. There are some really lovely versions on Ravelry like this one by Norbertine or this one by anitasr. Seeing patterns knit up is one of my favorite parts of being a Designer. Blush is now available as a re-release now part of the Kate Oates line. This sweater features YOTH Yarns Big Sister in Peach. Photos posted here by Veronika Jobe with her lovely daughter Jasmine modeling. 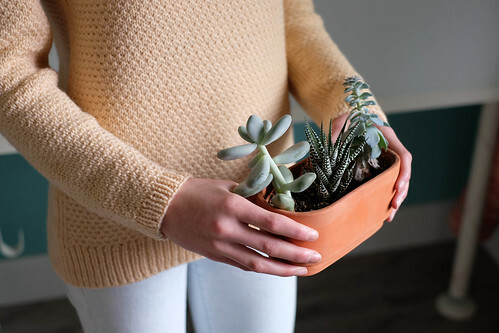 This sweater is a top-down seamless knit with raglan-style sleeves. There are a few short rows to add length to the back of the sweater and it is finished off with a cute little split at the back hem. The neckline is wide, in between a crew and a boatneck. The texture is cozy and soft and very pettable. A small width of ribbing on each side adds to the flattering fit. With this re-release, I did not take new pictures but I did do some pattern tweaking in areas where I have received questions. There are some new tips to clarify the trickier bits. It is a pretty straightforward pattern but now is even more so. One thing that folks have asked about is the texture pattern which I have labeled as Moss Stitch. My version came from Vogue Knitting: The Ultimate Knitting Book (2012). It features texture and stockinette on alternating rows/rounds. If you have worked a Moss Stitch pattern in the past and the directions do not match up with mine, no worries! The stitch pattern name does not matter. If it makes you feel better, you can even cross out my "Moss" and come up with a new label. 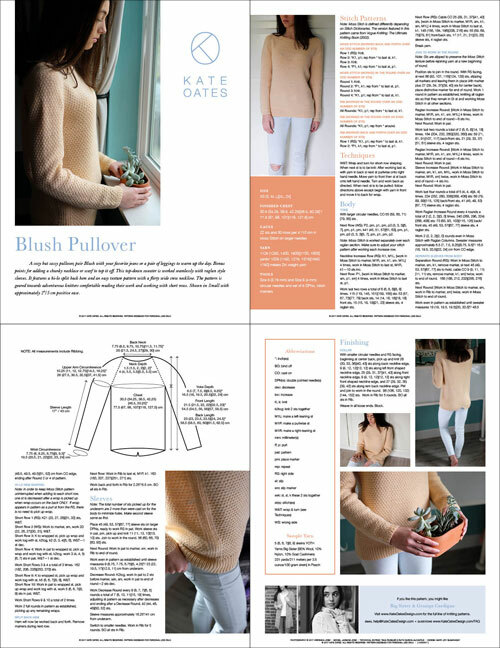 I can assure you that the stitch pattern instructions in Blush will provide you with the sweater you see in the pictures. This particular stitch pattern also is one that blocks out beautifully. Since you will be knitting a swatch (right? ), make sure you block the swatch so that you can see how nice it looks once it is dry. Swatching is even more important in textured patterns because many knitters will have a different tension when changing back and forth between knitting and purling on the same row, as opposed to stockinette where each row is either purled or knit. I am enjoying getting reaquainted with these previously published designs and it really makes me happy getting to see them after their makeover. Here is a preview of my new format so you can see it too! Enjoy 50% off this re-release today only with the code KATEOATES valid in the pop-up shop. When you shop on my site, you will automatically receive an e-mail with a download link to your pattern. If you create an account, you will also always be able to access the pattern going forward by viewing all of your orders. If you do not get your e-mail, you can check your spam filter for an e-mail from help@kateoatesdesign.com or just log into your account to see it. I have another handful of re-releases to show off over the next few weeks but am also very much looking forward to a brand new design coming next month. Congratulations to Jessica for winning a copy of (re) Gramps last week, and to LISAKOBY for winning a copy of the updated Blush. Leave me a comment this week telling me what part of fall gets you most excited for a chance to win a copy of the next KO pattern!